A fun and sweet drink, the IZZE peach candy corn cocktail features vodka with pineapple and a healthy dollop of whipped cream. 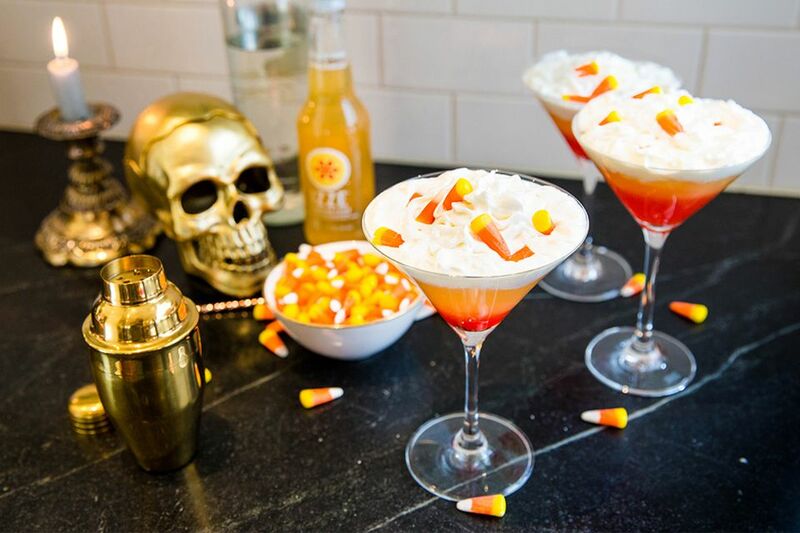 The cocktail is built in layers to replicate candy corn in the glass and it will make a fun addition to your Halloween party. This Candy Corn Cocktail is extremely easy to make because it uses the same 'sunrise' effect as the tequila sunrise. The grenadine naturally sinks to the bottom of the glass to create the red-orange base; a sparkling peach and pineapple-vodka mix form the orange center; the white topping is, quite simply, whipped cream. Anyone can pull off this stunning cocktail. Choose your favorite whipped cream vodka—Pinnacle, Smirnoff, UV, or so one. You can also go with a cake vodka if you prefer as the difference is not significant in this recipe. The real star of the show is the sparkling juice: IZZE Peach is light and refreshing and more juice than soda. It adds a nice effervescent touch to the drink that contrasts the heavy grenadine and cream, especially in that middle layer. If you're looking for a show-stopping Halloween martini that is unbelievably easy to make and something that all your guests will love, this is a perfect option. Just don't forget to add a few candy corns on top, they're half the fun! Pour the vodka and pineapple juice into a cocktail shaker with ice. Add the IZZE Sparkling Peach. Slowly pour in the grenadine. It will sink to the bottom. Finish the cocktail off with a healthy layer of whipped cream and a few candy corns. How Strong Is the IZZE Peach Candy Corn? In the world of cocktails, even at the full 6-ounce serving, this is not a strong drink. Most dessert vodkas are just 35% ABV (70 proof) and because that's the only liquor involved, the cocktail is a very mild 9 percent ABV (18 proof). That's the same as the average glass of wine.